The RCB Library recently solved a genealogical mystery concerning the family of Kinmonth from the parish of St Anne’s, Shandon. Whilst originally a family name of Norman origins, and with strong links in Scotland, Kinmonth is not a typical Cork name, yet some older Corkonians would have heard of the Kinmonth family as being poultry and egg merchants during the late 19th and early 20th centuries. William Kinmonth was a town councillor, Justice of the Peace, and President of the Cork Rowing Club, and lived in a fine house called Ferney, overlooking Lough Mahon in Blackrock, in 1911. Cork wits referred to him as ‘Chicken Choker’ Kinmonth. Michael Foley is a Kinmonth in-law, and as he was the only family member living in Dublin, took it upon himself to visit the Library of the Representative Church Body where there are now 1,155 collections of parish records, including over 80 from the city and county of Cork. 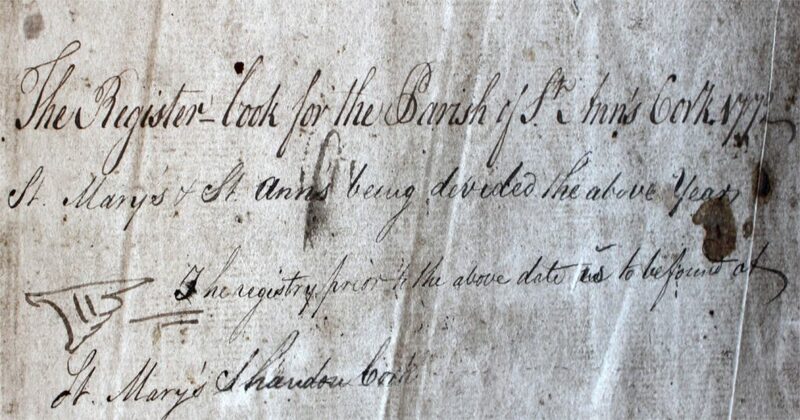 Initially he wanted to find the ancestor of ‘Chicken Choker’ Kinmonth – another William who had come to Cork in the early 18th century – but as he recalls himself “was not prepared for the mountain of records of Kinmonths” that he found recorded amongst the entries of baptism, marriage and burial – most of them in the registers of St Anne’s, Shandon, and the earliest of which was the baptism of a Thomas Kinmonth, on 29th April 1780 – some 249 years ago this month. He was the brother of Hugh Kinmonth, son of William and Elizabeth, baptised on 17th August 1790 – the great-great-grandfather of Michael’s wife. It did not end there, however. Going forward he found the baptism record of Hugh’s son Thomas, and forward again to the baptism of Thomas’s son, William Kinmonth, on 4th May 1842 – the poultry man. Three generations, all in the records of Shandon and all baptised in the same baptismal font that is used today. As well as reconstructing the movement of specific branches of the family, Michael made other interesting findings during his research. One was the detail given in entries about sponsors of children baptised – or ‘surities’ as they were called – which paint a picture of a very close-knit community with the Kinmonths ‘living in each other’s pockets’ of families such as the Clarks, Craigs, Franklins, Shuttleworths and Woods, acting as sponsors of each other’s children. Another unexpected turn of the wheel of history with the parish of St Anne’s and indeed wider diocese of Cork today is the property that William Kinmonth, the poultry merchant, whose humble origins as the son of a humble weaver evolved to his becoming a wealthy merchant and able to buy the grand house on 25 acres called Ferney on the shores of Lough Mahon. After his death, his family were the last residents in the house and sold it in 1940. For many years it lay empty before being demolished. By happy coincidence the land in the front and to the right of the house was used to build St Luke’s Home, which for 130 years has provided residential care and support services to older people in the Cork region – a virtuous circle! 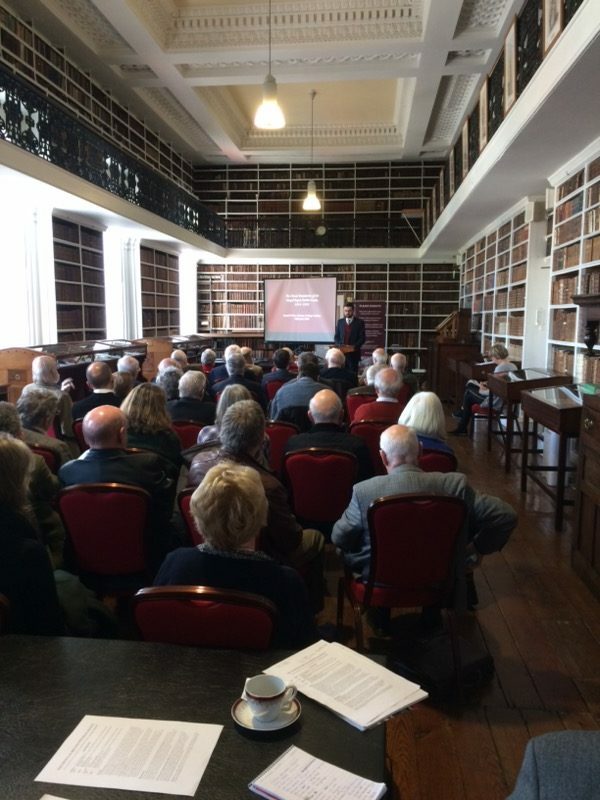 On Saturday 6th April, the Church of Ireland Historical Society (COIHS) hosted its first conference of the year in the Armagh Robinson Library. We had a superb turnout and wish to thank members, both old and new as well as day visitors who came to hear four excellent papers. We hope you enjoyed the day as much as we loved hosting the conference. As always, many thanks for the wonderful staff at the Library for assisting us. Professor Rachel Moss, who is Professor of Art History at Trinity College Dublin, initiated proceedings with a discussion on the impact of the Reformation had on medieval parish churches that passed on to the Church of Ireland in 1536. Mr David O’Shea, who is pursuing his PhD at Trinity College, Dublin, was the second presenter of the day. He delivered an excellent paper on the considerable music library of the Chapel Royal that has survived. He explored the complicated relations between the Chapel Royal, the Church of Ireland, and the lord lieutenants in Ireland. After lunch, Dr Andrew Sneddon of the University of Ulster gave a intriguing presentation on the life and career of Bishop Francis Hutchinson. He analysed the English bishop’s awkward relationship with his Irish episcopal colleagues. The day finished with a paper by Dr Susan Hood from the Representative Church Body Library in Dublin who discussed the records now preserved at the library. She revealed their national importance and how the RCBL has been very successful in digitising them, notably the Church of Ireland Gazette and architectural drawings. The RCB Library has recently been successful in obtaining a large grant for digitising parish church register, details of which you can read here. 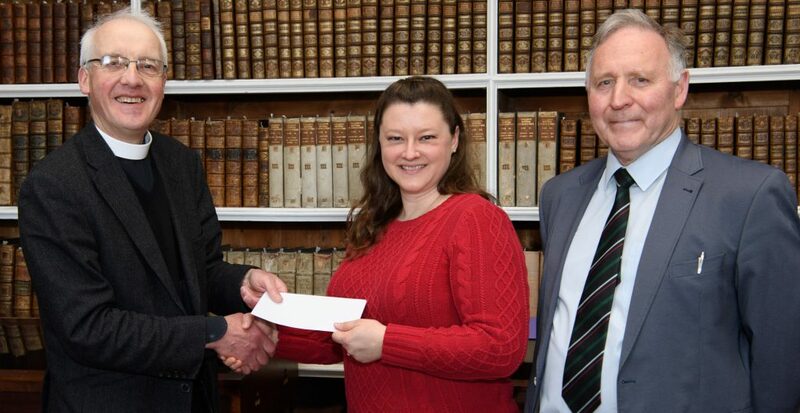 As part of the conference proceedings, Matthew Houston received a cheque of €150 for winning the 2018 W.G. Neely Postgraduate Prize. His essay was entitled ‘The great crusade? 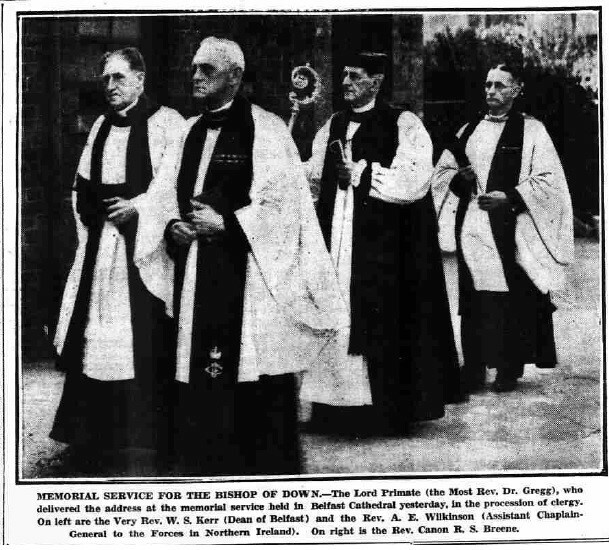 The Church of Ireland and interpretations of the Second World War, 1939-45’. Matthew recently wrote a blog on his prize-winning essay which can be accessed here. Postgraduates interested in applying for the 2019 Neely Prize can obtain details by clicking on the following link. Members of the Society will be notified when the presentations delivered by Professor Moss, Dr Sneddon and Dr Hood are available on podcast. If anyone wishes to hear these papers but has not joined the Society, you are welcome to subscribe to our annual membership by visiting our membership page. Postgraduate students can avail of our special discount membership but are asked to email the secretary with proof on institutional affiliation prior to subscribing. Please visit the contact page. All members of the public are welcome to join COIHS. Under the terms of the Irish Church Act (32&33 Vic. c. 42 sect. 2) of 26 July 1869, which passed into law in 1871, the union between Church and State in Ireland that had existed since the Reformation was dissolved, and the Church of Ireland ceased to be established by law: leaving it ‘free to shape her future course, independent of state control’ (Journal of the General Convention, 1870, With the Statutes Passed and An Appendix … edited by the Revd Alfred T. Lee, Dublin, 1871, pp v–vi). A new display of materials relating to this momentous event has just commenced at the RCB Library which is the Church of Ireland’s record repository and reference library. The exhibition will continue on a rotational basis throughout the anniversary period. Many of the materials – created both immediately before and after the enactment of 32&33 Vic. c. 42 sect. 2 – were formerly securely stored in a metal trunk labelled ‘General Convention Box’, housed in the central offices of the Representative Church Body (initially at 52 St Stephen’s Green, and more recently at Church of Ireland House in Rathmines) before their transfer to the Library in 1998 where they were accessioned in detail as the GC/ series). Collectively the collection charts the evolutionary story of the state–run Church to an independent, largely voluntary and minority denominational Church, from the perspective of those who achieved tasked with making that transition happen. Click here to see the catalogue list. The initial display which may be viewed in the Library’s entrance foyer includes a selection of the papers, minutes and resolutions of the Committee of Laymen as it met in the build–up to the legislation going through – practically 100 years to the day. These are representative of the early influence of the laity in the general deliberations which re–structured the Church and ensured that the laity would become one of the three orders of the reconstituted institution – on an equal footing with bishops and clergy. From March 1869, a Consulting Committee (which the Committee of Laymen fed into) began the process by hosting an initial church conference of archbishops, bishops, clergy and laity in April 1869. This gradually evolved into a Standing Committee and related General Committee or Church Committee, which was entrusted to organise the General Convention of 1870. The Convention was held in open session between 15 February and 4 November 1870 at the Ancient Concert Rooms, Great Brunswick Street (now Pearse Street), and represented the all–island Church. Every diocese and parish sent clerical and lay delegates who collectively set about the lengthy and painstaking work of drafting a new constitution, producing its standing orders, and completely overhauling the financial structures. The Convention would evolve into the Representative Body from 1870. 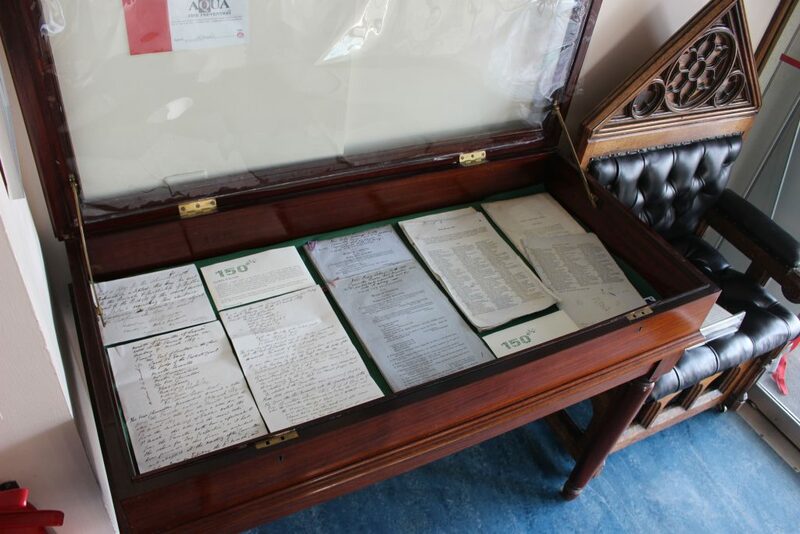 Also on display are some of the draft ‘Votes and Proceedings’ parliamentary papers that document the various bills and amendments that lead to the Irish Church Act as they were going through both Houses of Parliament in London, and scrutinised and annotated by the Church of Ireland’s Operating Committee over in Dublin. Strict instructions were given to committee members that these documents belonged ‘to the Committee Room’ and that ‘no person should take [them] away’ as the display reveals. 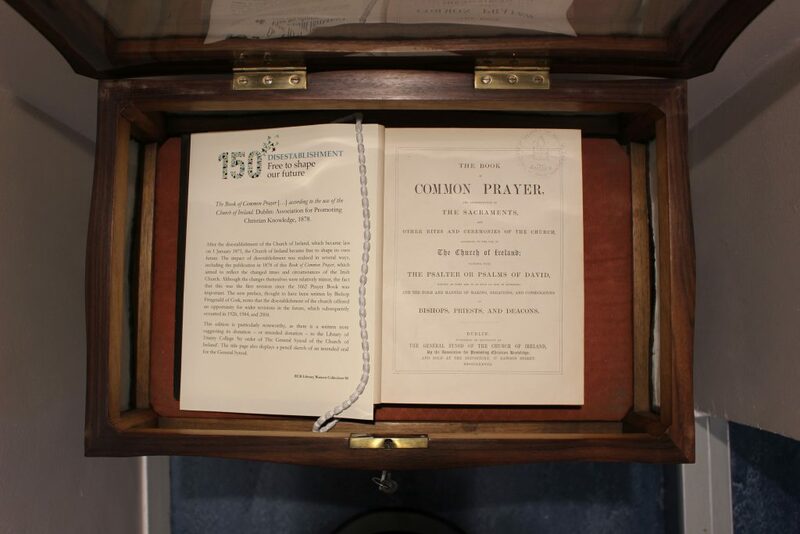 Finally, a sample prototype copy of the first edition of the Book of Common Prayer published after Disestablishment ‘by order of The General Synod of the Church of Ireland’ in 1878 is also shown. In the aftermath of the Church’s changed status one of the major tasks was to reflect the changed times and circumstances of the Irish Church in the text of its prayer book. Presentation copies sealed with the Seal of the General Synod were ordered for various other Anglican Churches and bishops around the world, as well as the Robinson Library in Armagh, Archbishop Marsh’s Library in Dublin, and the Library of Trinity College Dublin. The volume on display is particularly noteworthy for a written note suggesting its donation – or intended donation – to the Library of Trinity College on the title page, with a pencil sketch of the intended seal for the General Synod and comes from the Library’s Watson Collection of prayer books and related items. 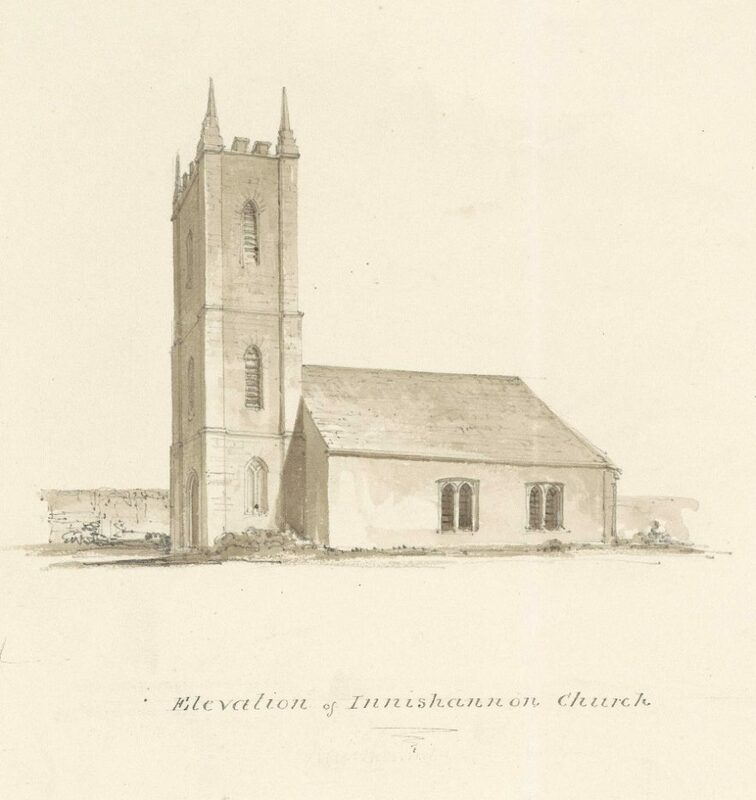 The project to digitize, catalogue and make available online the Church of Ireland’s collections of architectural drawings of churches housed in the Representative Church Body (RCB) Library has reached another significant landmark, with the completion of imaging ten albums of early 19th-century drawings of churches, amounting to some 1,500 drawings. 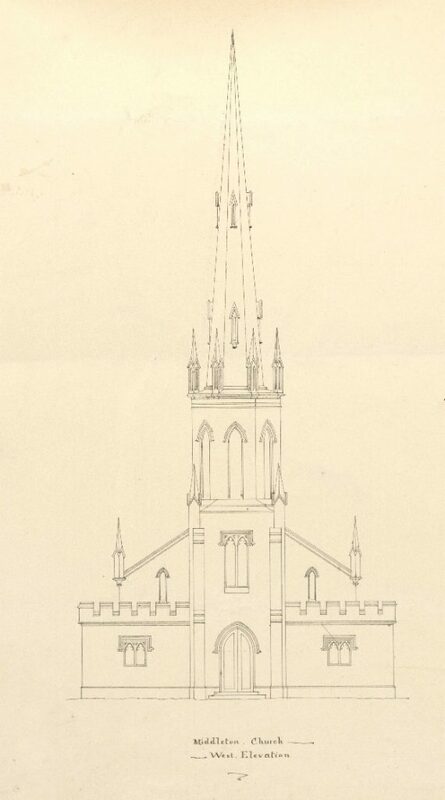 All digital copies of these drawings which cover a total of 591 different church buildings have now been uploaded to the searchable database at https://archdrawing.ireland.anglican.org/items and are now freely available for viewing and searching. Sustained commitment from the Church’s central funds and specific donations from particular dioceses has enabled this huge project – which originally commenced in 2011 – to continue apace, with the result that a total of 8,615 drawings for some 1,558 church buildings, and a further 73 glebe houses and rectories are now available online. The work has been assiduously carried out for the RCB by architectural historian Dr Michael O’Neill who additionally has put together a specific online exhibit focusing on the album content. The Pain and Welland albums – as they are known in-house among Library staff – comprise some eight albums of survey drawings and two albums of working drawings commissioned by the Board of First Fruits and Ecclesiastical Commissioners of Ireland. In historical terms they collectively can be regarded as part of the inventory work of the newly established Ecclesiastical Commissioners in 1833 getting to grips with its role – taking over from the Board of First Fruits in church building and repairs. The ten albums, or rather eight of the ten (the final two contain proposals and working drawings), record the result of frenetic building activity by the Board of First Fruits (founded in 1711) in the period 1784 to c.1827, when the Board’s funds were very significantly increased by parliamentary grants. During the years 1808 to 1821 government funding was enormous and restrictions on church rebuilding were lifted. The Board also provided significant loans for the building of glebe houses. The six earliest albums contain drawings by the architect of the Board of First Fruits James Pain (c. 1779-1877) and record the churches in the dioceses of Cashel and Emly (44 churches), Cloyne (65 churches), Cork and Ross (78 churches), Killaloe and Kilfenora (59 churches), Limerick and Ardfert (72 churches), and Waterford and Lismore (39 churches), totalling 357 churches. Pain generally provided a ground plan, showing the internal arrangements, an external elevation, and a site plan for each church. The four later albums contain the drawings by Joseph Welland (1798-1860). Welland was born in Midleton, Co. Cork, and trained in the office of John Bowden, the first architect employed by the Board of First Fruits. When Bowden died in 1822, Welland inherited some at least of his practice and also became provincial architect for the province of Tuam. Two of his albums cover the ecclesiastical province of Tuam and part of the province of Armagh. 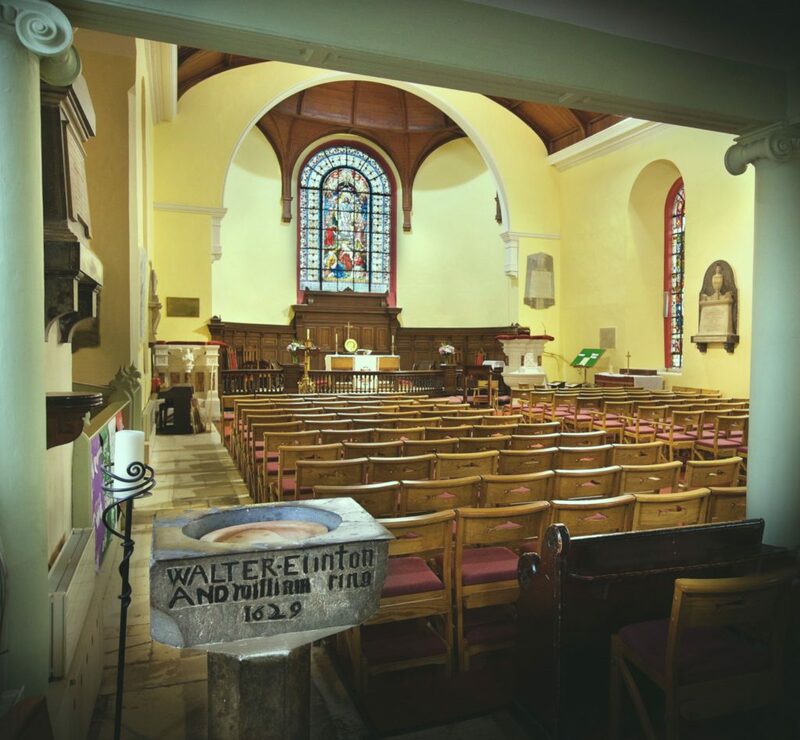 They cover the dioceses of Killala (11 churches), Achonry (nine churches), Ardagh (11 churches), Elphin (28 churches), Kilmore (28 churches), Meath (64 churches), Tuam (26 churches), Clonfert (10 churches), and Kilmacduagh (four churches). Ardagh, Kilmore and Meath were in Armagh province, the other dioceses were in Tuam province. Welland devoted a single page to each church, providing a ground plan with the internal arrangements rendered in detail and a site plan. Unfortunately, he did not provide elevations and, as a result, the massing of the buildings cannot be as easily read as with slightly earlier Pain inventories. These drawings are of First Fruit churches – rectangular buildings with a west tower – which remain iconic features of the Irish landscape. Often dramatically located, sometimes in seemingly isolated places, they generally replaced medieval churches on the same sites. They mark medieval settlement patterns in what is the palimpsest of the Irish landscape which is now largely overlain with the 18th-century field system. The Church of Ireland inherited the apparatus of the medieval Irish Church, and some of the sites are from an even earlier dispensation. Collectively the albums provide a key source for understanding the major First Fruits church building phase (1780s to 1820s), many of which were subsequently repaired, rebuilt or extended from the later 1830s to the late 1860s. The inventory work that they capture actually coincided with the Ordnance Survey mapping project of the whole country, which definitively mapped the civil (Church of Ireland) parishes, a project not undertaken since the 17th-century Down Survey. As with the Ordnance Survey Letters (John O’Donovan et al), and the recording of antiquities by George Petrie and George Victor Du Noyer, Pain and Welland also knowingly recorded quite a significant number of medieval churches, still then in use. Inevitably, many of these too were replaced in the ensuing decades. 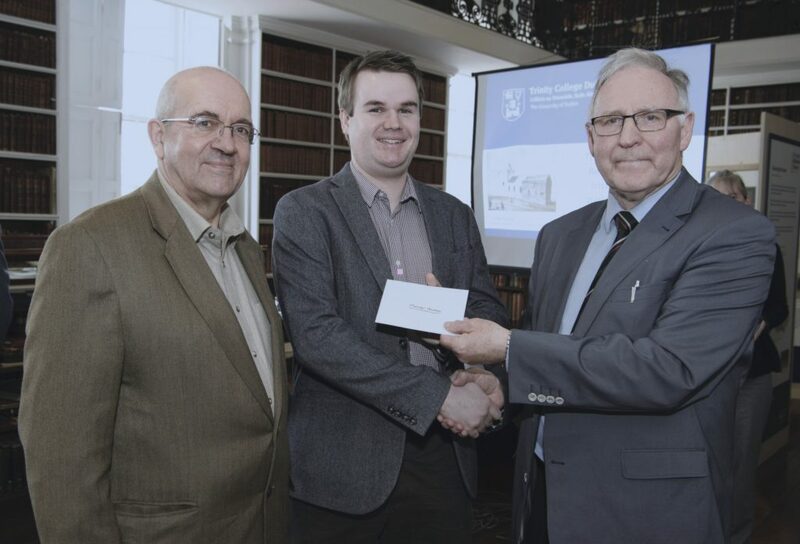 The RCB Library is most grateful to Dr O’Neill for his painstaking and enthusiastic work for over eight years to make sense of the Church of Ireland’s immensely rich architectural collections and ensure they can be appreciated by a worldwide audience. 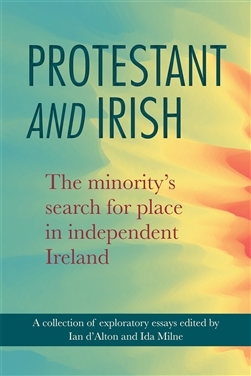 On Tuesday 12 March former Senator, TD and Minister Dr Martin Mansergh will launch Protestant and Irish: The minority’s search for place in independent Ireland, edited by Ian d’Alton and Ida Milne, and published by Cork University Press. It will take place at 6.30pm in Carlow College, College Street, Carlow town courtesy of the president, Fr Conn Ó Maoldhomhnaigh. The book looks at how southern Irish Protestants tried to come to terms with newly-independent Ireland and how many attempted to fit in and ‘offer a method of living valuable to the State’. Books will be available for sale on the night. There will not be written invitations for this event, but all are welcome. If you intend on coming to the launch please email Ian d’Alton at the following address: iangdalton@hotmail.com. 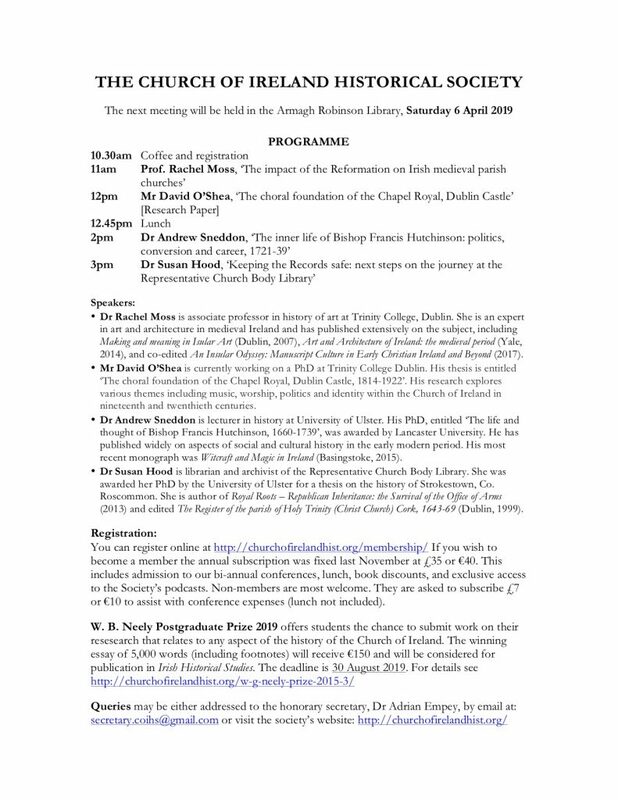 The Church of Ireland Historical Society’s first conference of the year will be on Saturday, 6 April 2019 in Armagh Robinson Library. The library is located at the northwest entrance gate to the Church of Ireland Cathedral. Tea and coffee will be served from 10.30am and the first paper will start at 11am. Confirmed speakers are Prof. Rachel Moss (Trinity College, Dublin), Dr Andrew Sneddon (University of Ulster), and Dr Susan Hood (Representative Church Body Library, Dublin). The research paper will be delivered by Mr David O’Shea, who is pursuing his PhD at Trinity College Dublin. The full programme can be seen below. We would also draw your attention like to draw your attention to the recent announcement of the W.G. Neely Postgraduate Prize for 2019. We strongly encourage eligible students to consider availing of this great opportunity, details of which can be found here. The conference is open to all members of the public. There is a daily fee of €10 (or £7) for non-members to assist with conference expenses, payable at the registration desk which will be located in the Robinson Library, but anyone can become a member for €40 (or £35). Those who join the Society will be given exclusive access to the podcasts which record these papers, particularly popular among those who are unable to attend either of our conferences in Armagh or Christ Church Cathedral, Dublin (in November). Members will also be able to avail of significant discounts on select books that will be on sale on the day of the conference. For further details of our membership package please visit our membership page. The early years of the 17th century saw an attempt to introduce a system of public registration in Ireland, similar to that in Scotland in 1616. Although adherence to this was not necessarily followed by all Irish parishes immediately, the register of the parish of St John the Evangelist, positioned to the immediate north of Christ Church Cathedral on what is now Fishamble Street, was a forerunner of what would become the accepted norm throughout the island of Ireland in the following years. 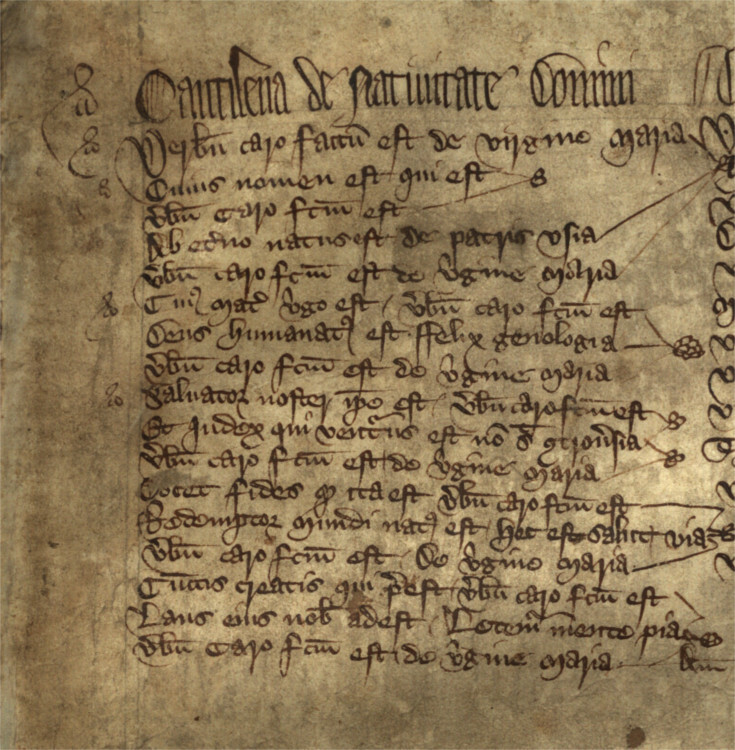 The book which is housed in the RCB Library, in the context of a host of other parish records (for a detailed list, see here: http://bit.ly/2Fu2wMn), was begun by the clerk Bartholomew Jordane on 7th February 1619, and records a number of christenings and marriages that occurred in the church during that month. The first inscribed record (an attempt to record a burial was subsequently erased) is that of the marriage of Richard Browne and Mary Woott, recorded on 27th February. The earliest actual record is immediately after this, noting the christening of Christopher Hoord on 16th February. The book itself contains entries from 1619 to 1658. This period was a turbulent time in the history of Ireland, and the end of the book lists a remarkable amount of burials. The pages are titled ‘The Names of ye poore English who having fled to this Citie for refuge and Dyed in ye parish of St. John’s, were buried since 30 Decemb. 1641’. A page following is titled ‘A Catalogue of ye poore souldiers who were buried in St. Johns since 24th Apr. 1642’. Indeed, from November 1641 onwards, we see a noticeable increase in the recording of burials in the register in the following year, with some months recording only a long list of burials, reflecting the political crisis during this time. The entries themselves are in immaculate condition. 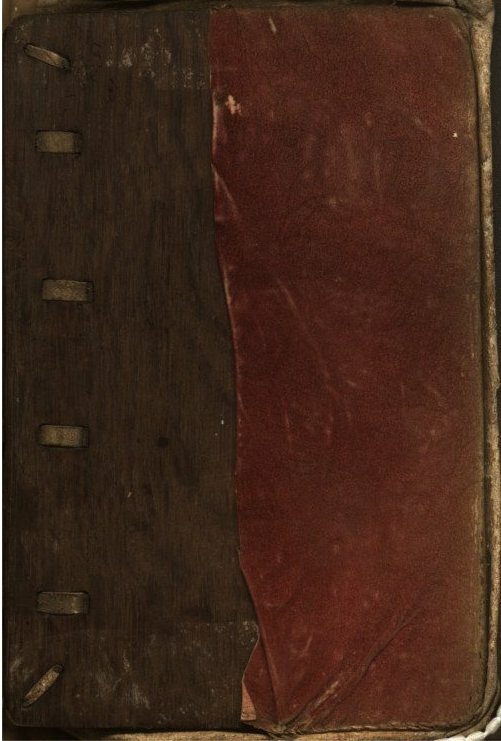 The pages on which the entries are written are made of vellum (probably sheep hide), and would have originally been loose-leaf but were subsequently bound in an ornate brown leather, with gold lettering denoting the parish details and the years contained within. The book itself was ‘gifted’ in June 1630 by John Hubbords, who is presumed to be the same as the John Hobarte, who is listed as churchwarden in 1623. 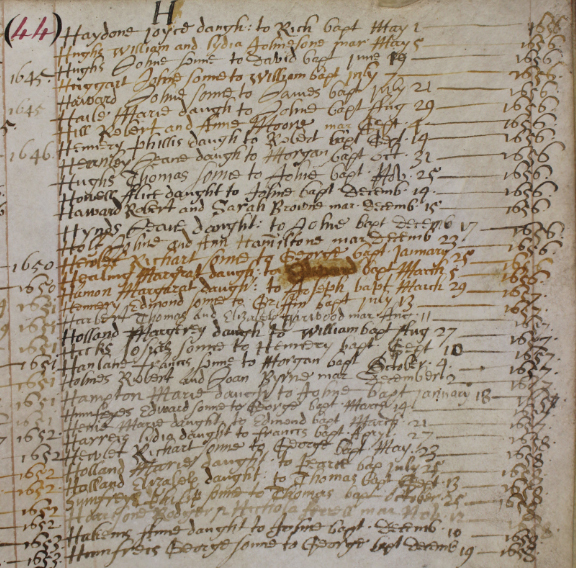 The record of the burial of John Hubbords is recorded in the register on 12th June 1630.